If you've been following us on social media, you know we've been cookin' up something fresh + exciting for you guys- our loyal community! In case you missed it this week, we are proud to kick off daily themed posts. As entrepreneurs, we realize that it can be difficult to find like minded “thought partners” to help us gain deeper insight into our business goals. We'd like to provide a platform to better connect with one another and provide constructive ideas, perspective, criticisms, motivation, you name it. Today we're introducing Thursday's theme: Coffee Talk. One of our favorite activities is getting together with some of our creative colleagues + asking each other questions. Coffee Talk Days are dedicated to answering some of those questions we hear the most... So here it goes! HOW DO I GROW MY SOCIAL MEDIA FOLLOWING? The straightforward, honest answer is something you might not want to hear. It's not a quick fix. Growing your following, boosting your engagement... It takes proper knowledge, time, effort, discipline, trial, error, analysis, access to content, and a good sense of self. So where do we begin? Based on our experiences + client assessments we've come up with some ways to reframe your mind around social media growth. Take a moment to ask yourself what your definition of success is for social media. A common concern among most of our clients is having insecurity around the amount of followers + likes they have. For some reason (for a lot of people) this directly translates to legitimacy, but similarly to nurturing your relationships IRL*, a lot of followers might look really cool, but it's hard to maintain quality if your main focus is to appeal to larger quantity. Which begs the question, why do the numbers matter right this second? "But what if potential customers or collaborators don't think I'm legitimate enough?" The bottom line is, your relevancy is more susceptible to being compromised if you aren't spending time generating authentic engagement with your tribe. Without identifying a purpose that is beyond just numbers, the numbers become irrelevant very quickly. Instead of thinking about growing your following to 1,000 more, try to think of ways to make your brand more memorable + recognizable so that when you do get more numbers, your brand resonates with your audience. Also remember that these things take time. 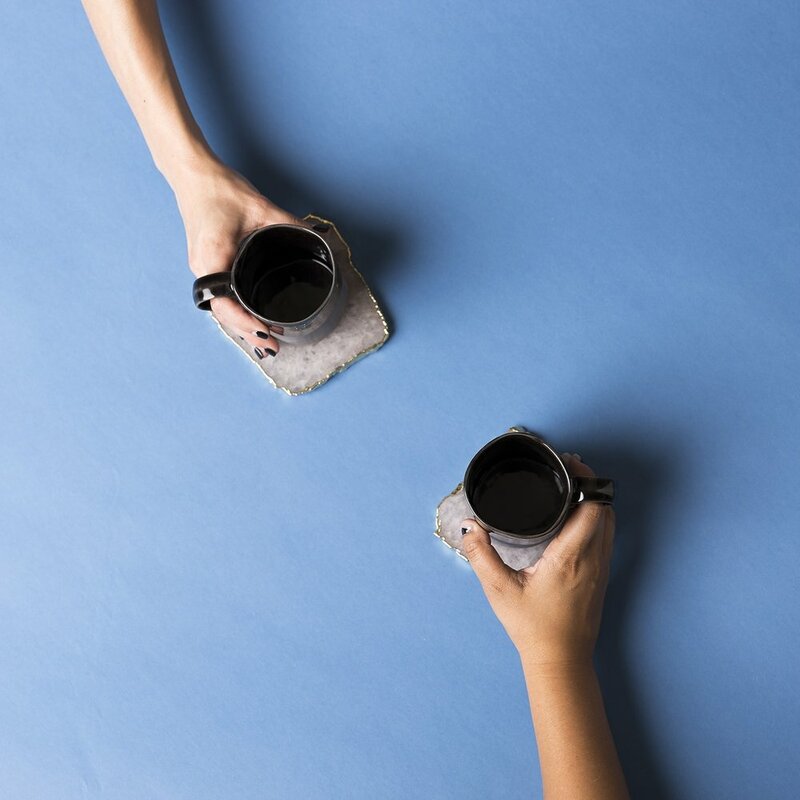 You don't usually become best friends with someone after one coffee date, so why should the people actually purchasing your product or service be any different. Trust us when we say, focusing on steady, organic growth is in your best interest. 2. REMEMBER WHERE'S WALDO? YOU'RE ONE OF THOSE RANDOM GUYS WEARING THE SAME SHIRT AS WALDO. You are ONE of 800 million other users (25 million being businesses), and that's only Instagram. Let that sink in for a second... and don't get discouraged. Instead, challenge yourself: How are your clients going to find you, if they don't even know you exist? Why would they want to invest in you when there are so many other options? This is where it gets interesting. Marketing + Advertising are not the same as they were even 10 years ago. Marketing budgets that were once more commonly accessible to larger, corporate companies are now completely accessible to everyone. The internet is a very powerful tool, and it doesn't cost a lot to get your name out there, so take advantage. Be careful about getting so caught up in what is trendy or popular. While it's important to listen to your audience, also remember that we have the luxury + opportunity to embrace ourselves and showcase it to the world. That gives us the choice, the freedom, the power to hone in on our ideal audience. Identifying your target is important, but identifying yourself first is necessary. Remember earlier, when we mentioned that being memorable + recognizable is key? It's the reason there are brands out there that are over 50 years old. When you set your intentions + purpose, you gain a better sense of who you'd like to reach. The idea of discovering your brand and your audience go hand + hand... They can have a bit of conflict once in a while, but when you create the perfect storm, they grow together. Take a deeper look inside.. We understand that not everyone has the luxury of time; however, if you're already investing in social marketing it's imperative to understand who are you as a brand. Because the world out there is big, and you need to figure out what makes you stand out. Once you start implementing these philosophies, that's when you start learning about your audience. Along with identifying yourself, comes the necessity to produce amazing content. Consistency + cohesion is absolutely key for recognition: This means using the same editing style, color palette, voice, everything. The moment you start practicing this is when you should start paying attention to the response. If you know who you are, and you're expressing yourself on social media, you probably have a lot of information to pull from. And if you're collecting that information... We hope to goodness you're utilizing it! What a gift. With all of this being said, keep in mind that nobody wants to be sold to. Social Media is a place to showcase who you are as a brand (no sales pressure attached) and get to know the people who will hopefully, eventually buy into your brand. We mentioned before that we have the ability to choose who we want to engage with, but it's up to us to put ourselves out there. Go to the party, walk up to people, and say hello. Okay, but how do I do this on the internet? Research, analysis, data, and implementation... Say you’re a local restaurant. Start by searching your location in the search bar. Click on people who have tagged themselves in that location, and go engage with their content. We swear it's not creepy. People feel loved + relevant when brands engage with them. It feels genuine + authentic - almost as if you're saying hello to them on the street while opening up shop. If you engage with them, the likelihood they'd come over to your page and spread the love is instantly higher than it was before they even knew you existed. Don’t just be there to be on Social Media because everyone else is doing it. If you’re going to invest even a little time in social marketing, take the time to get it right because the power is valuable and most importantly, so is your time. Which brings us to the topic of time: We will go ahead and reiterate that Social Marketing takes time + effort. Just like building lasting relationships and just like growing up, these things take patience, time, and consistency. Maintain momentum. Try not to bite off more than you can chew, and try to keep at it even when you're feeling discouraged. Comparison is the thief of joy. Do not get so caught up in what other businesses are doing, because whatever they're success may appear to be shouldn't set you back from your goals. We hope this post was insightful or helpful. Please feel free to comment with any questions. We'd love to cover new topics for Coffee Talk Days. We'd love to keep you in the loop! Sign up with your email below for more tips, inspiration, and community connection. We can't wait to connect with you again soon! Stay tuned!